This week’s word of the week post is a threefer, and all of them are honest-to-god words that I didn’t know existed until I learned them in a video game. I feel it’s due, since I haven’t written much about video games here since my “It’s a Secret to Everybody” post last month. (Though, at 80,000 unique hits to that post alone, I guess it’s not much of a secret anymore. Thanks Destructoid! And Kotaku! And GayGamer! And Digg! And Mental Floss! And Pajiba!) Following that post, I’ve had some interesting email exchange with other linguistically minded game nerds. One in particular wrote me about word changes in Final Fantasy IV, a text-heavy game that’s evolved quite a bit since its clunky English release for the Super Nintendo in 1991 and the third reworking of it, which came out last year for the Nintendo DS. (And yes, I do realize the irony in that a game called Final Fantasy has been given multiple sequels and that those sequels have themselves been remade and remade again. Recently, game blogs have been circulated the explanation for why the first game had the word final in the title.) As time has passed, dumb-downed translations of the original Japanese have given way to GRE vocab selections and, perhaps most surprising, some actual character development. I’m not sure why the translator for this most recent version of the game chose to pick the words he did, but the end result was that I learned a few words. 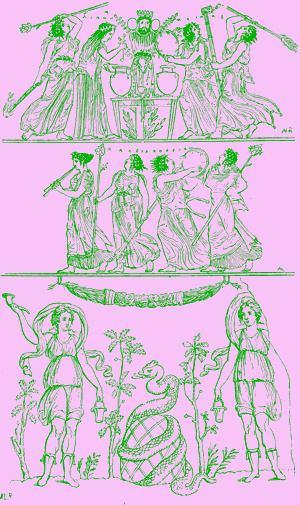 epopt (ee-POPT or EE-popt) — noun: 1. an initiate into the ancient Greek cult of Demeter and Persephone, which was centered at the town of Eleusina. 2. one instructred in the mysteries of a secret system. 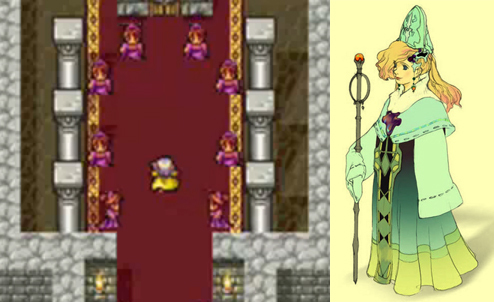 The fact that the Eleusinian Mysteries would focus on two of Greek mythology’s major goddesses is particularly appropriate for the Final Fantasy IV epopts because they exist in a city dominated by women: female soldiers, generals and merchants, with eight epopts calling the shots from atop the social hierarchy. In the original version of the game, these ruling women were referred to only as clerics, which, if you take the newest version of the game as the “correct” one, isn’t inaccurate, per se, just less evocative of some higher female divinity. The direct sequel to Final Fantasy IV, The After Years, features a playable epopt, Leonora, who is a proficient magic user and also a cute-as-a-button blondie, as even the mightily spiritual video game heroines must be aesthetically appealing. I suppose as far as video games using obscure words drawn from mythology, the mention of epopt in Final Fantasy IV is a fairly appropriate one. seneschal (SEN-ə-shəl) — noun: an official in a medieval noble household in charge of domestic arrangements and the administration of servants; a steward or major-domo. What the new versions of the Final Fantasy IV refer to as a seneschal was previously just advisor or chancellor or something similar, if I remember correctly. Perhaps only by virtue of being more esoteric, the title seneschal lends the character a loftier sense of importance. I intend to refer to my butler as my seneschal. When I hire him, of course. According to Wiktionary, the term comes from the Proto-Germanic word parts sini-, meaning “senior,” and skalk, meaning “servant.” (That skalk apparently also morphed into the second syllable of the word marshal, literally “horse servant.”) Seneschal may be more familiar to French speakers, as it is a cognate with sénéchal (“a representative of the king, charged with the application of justice and control of the administration under the Ancien Régime of southern France”), which would be the person in charge of a sénéchaussée. eidolon (eye-DOH-lən) — noun: 1. an unsubstantial image, a phantom. 2. an ideal. Of these three words, I would have guessed that eiodolon would be a Final Fantasy-specific word. (The game does have its own terminology, after all. The fictional ratite known as the chocobo, for example.) But this word did, in fact, exist before the advent of video games. In theosophy, the eidolon essentially means “astral double” — “a phantom-double of the human form; a shade or perispirit; the kamarupa after death, before its disintegration.” Etymologically, the term is related to idol. 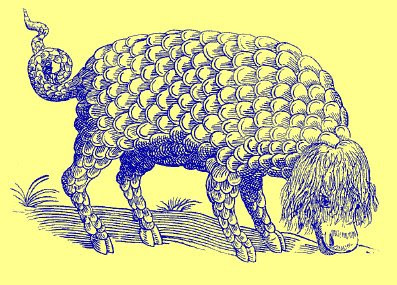 catoblepas or just a stupid gnu? Early in the series, the English version of the games just refer to these creatures as summons or summoned monsters. The ninth game used the term eidolon, and it was then retroactively applied in many remakes and sequels to previous titles. It’s so widespread, in fact, that a simple Google search for eidolon brings up the Final Fantasy-related version of the word first. Thus, three words I didn’t know until video games taught them to me. Perhaps not the most useful words in the English language, but something to show for hours wasted in front of a television set, right? I learned the word 'seneschal' from a game, too: Ultima VIII. Come to think of it, I learned a number of good words from the Ultima series: 'thaumaturgy', 'lyceum', 'tenebrae', 'vespers', 'reagents'. The later games might have been pretty lame, but at least I learned some good vocab to pepper my junior high essays with! Actually, I am not familiar with lots of gaming terms. I remembered the time when I am noob on playing Wow, I mostly keep browsing wowwiki for me to understand some unfamiliar terms that I encountered. Thanks for having this! I really learned a lot.